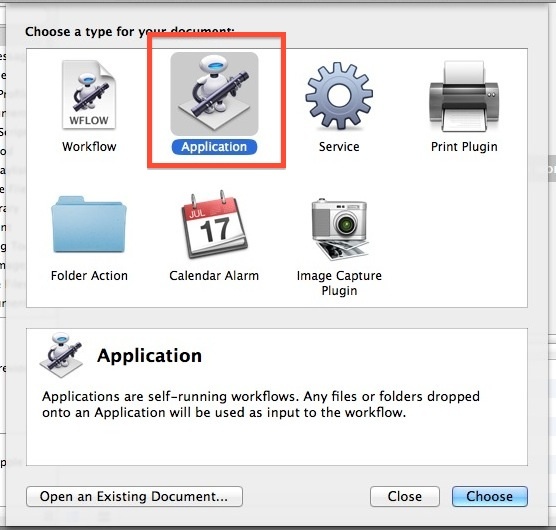 If you need to rename a group of files on a Mac by appending some text to each files name, a great free option is to use a simple Automator action and save it as an application. This is similar to the other Automator utilities we have built and covered here before, but this time around the end result is an OS X application that lets you rename a file, multiple files, or a group of many files by adding some predefined text into the file name, all with the same Finder-based drag and drop simplicity of usage. If you have tons of files to rename, you’ll find this is much better than renaming them yourself in the Finder or through the title bar. 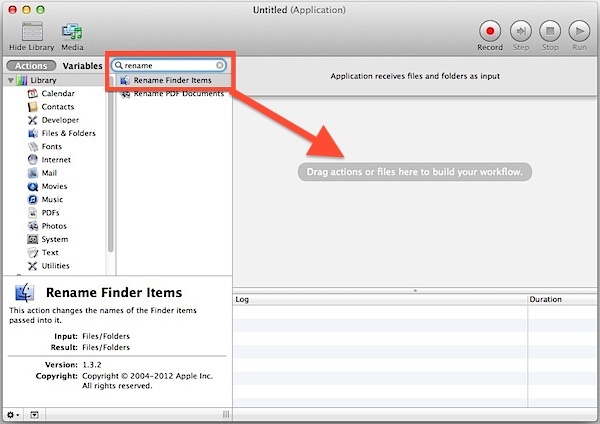 If you’re unfamiliar with Automator and creating Automator applications in OS X you’ll find the process to be quite simple, so just follow along and you’ll have a simple working app to rename files in no time at all. Due to the simplicity and general user-friendliness of this specific usage of Automator, advanced users may prefer this command line method of renaming files instead. Of course, this Automator action could also be modified heavily to be made more complex, handle additional file functions like resizing images at the same time, or rename with wildcards and incrementing, but for this specific article we’re aiming to keep things easy and accessible to everyone, even novice users who are new to scripting and automation. On we go! This is going to create a small application that appends text to every file dropped onto it, effectively renaming the file by adding another specified text item into the files existing names. 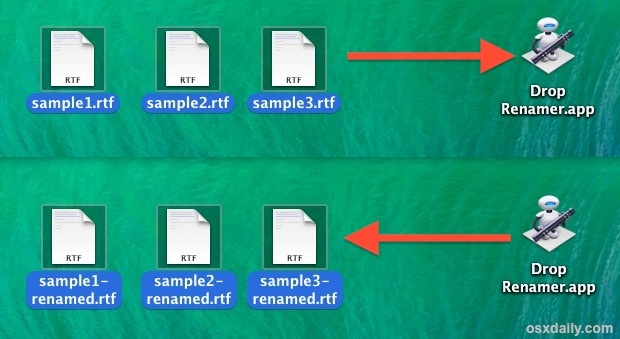 For example, if you have a group of files named sample1, sample2, sample3, dropping them into this application would rename them all to sample1-renamed, sample2-renamed, and sample3-renamed, respectively. That’s all there is to it. You have built a simple app that will rename whatever files you direct to the application. Next, let’s test it out. 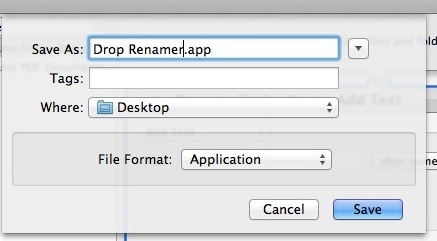 Now you can try the batch renamer app out by dragging and dropping any file(s) you want renamed onto the application. This simple DIY app will handle as many files as you throw at it, so whether it’s a small block of files you need to append some text to the names for, or a huge folder of thousands of files you want to rename, it’ll do the job. Of course with huge batch processes of hundreds or thousands of file renaming, it will take a bit longer, so give the Mac time to complete the task. Try it out yourself by selecting a file or multiple files and dropping them onto the renamer tool you just made. To be completely clear, anything dropped onto this application will be renamed according to the added text specified in the aforementioned steps. If you want the renamed text to say something else, you’ll need to edit the application again through Automator and save it. There are certainly more complex ways to handle renaming files, whether it’s using more complex actions in Automator, or using third party tools like Name Mangler or NameChanger, but for something truly simple and free, this basic Automator app does the job. Having fun with Automator? Be sure to check out some other interesting and powerful things you can automate throughout OS X using the bundled app on every Mac. BTW toying around with this today, you can also replace text if you want a literal rename function, like changing files named “this” to “that” by using the “Replace Text” workflow in Automator. A very simply and free solution that I use for all my pictures is NameChanger. Allows you to easily bulk rename files with sequence as well. Thank you for the tutorial, very simple and very helpful. I would like to rename 10K files with random names time to time – photo files in digital photo frame – to make them showing up in deferent order. Would you please recommend some tool, app or solution? This worked great for me … my first go with Automator, which is a pretty cool app. Can you tell me how i can add to the script so that my renamed files will go to a particular destination folder on my Mac? Thank you! Never mind! Got it! Extremely useful – thanks so much. This just has saved me lots of time and effort! thank you very much, before I didn’t even know what was the “automator” for. Very clearly presented. For some work I still use a laptop with an OS X verison that doesn’t include the rename option in the pop-up menu. The tutorial was easily adopted to rename a batch of image-1, image-2 files to thumb-1, thumb-2 etc.